I have finished knitting Agate Ripples. 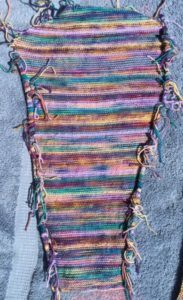 (pattern by Laura Bryant, Knitters Mag Fall 2015) Stripes are easy to knit, but it takes practice to not worry about how it is going to look when done, as you randomly select each yarn and how many rows to knit with it before changing. You also can’t bother about how many ends you are going to have to deal with. There isn’t a way to game the system. There will be ends! While knitting, I leave 5 in. tails for all ends. It’s a good habit to have, as it leaves you plenty of options with how to deal with them. You can tie them together and leave as fringe, or cut them off after knotting. You can bury them in the seam, Annetarsia-style. Or, you can just ignore them if the yarn is thin and won’t bother you while wearing the sweater, and deal with them later (much, much later) if you feel like it. After knitting, I block the piece before dealing with any ends. This sets the stitches, softens the fibers, and straightens out the knitting. 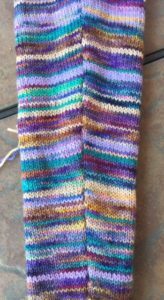 Blocking sleeve. Seen from the wrong side. I sew the seam with mattress stitch, ignoring the ends, which are hidden inside the sleeve. After the seam is done, it won’t look great until the ends have been flattened or eliminated. At this point, I determine what to do with the ends, and if I don’t want to deal with it now, I will press the seam to make it pretty. I do all of this before sewing the sleeves into the garment, because it is easier to work with a single piece than an assembled sweater. The Koigu yarn is thin and soft, so I am going to start by burying the ends in the seam with my chenille needle. If it seems too bulky after a few inches are done, I will just knot 2-3 ends together, clip them short and leave them be. 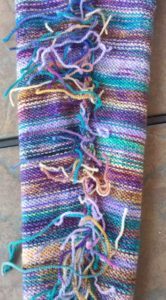 Seam finished but not blocked, seen from right side. Seam from the wrong side, not blocked, ends not dealt with.